MANILA, Philippines - Flagship noontime programs of ABS-CBN and GMA-7 slightly declined in national TV ratings last Saturday, October 3, 2015 based from the data of Kantar Media. GMA-7's Eat Bulaga bannered by its 'Kalyeserye' segment which has the fast-rising AlDub loveteam composed of Maine Mendoza a.k.a. 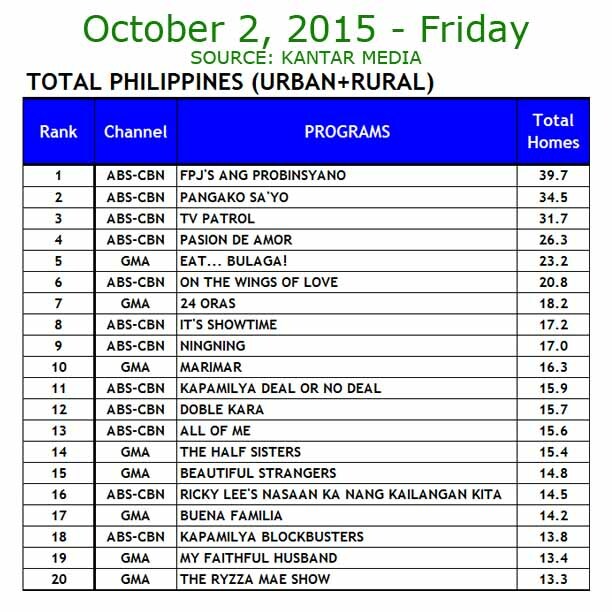 Yaya Dub and Alden Richards garnered 27.7% of ratings with its #ALDUBmeetsTVJ episode. On Saturday, the Yaya Dub, Lola Nidora (Wally Bayola) and Lola Tinidora (Jose Manalo) visited the icons of Eat Bulaga Tito Sotto, Vic Sotto and Joey de Leon known as the TVJ in the Broadway Centrum. 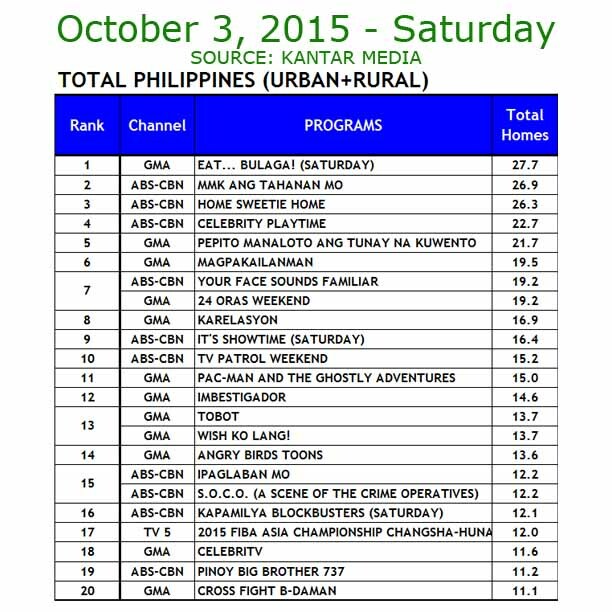 Compared to previous weeks, Eat Bulaga got 29.6% on September 19 and 30.8% recorded on September 26. #ALDUBmeetsTVJ also garnered around 10 million tweets as compared to 25.6 million total tweets recorded from the previous week. Controversial statement of Joey de Leon about linking AlDub loveteam to the hit historical film Heneral Luna and the 'kababawan' tweet issue of Broadway Diva Lea Salonga may have caused of the decline in ratings. It's Showtime on the other hand which gave tribute to the unwavering support of Kapamilya fans in Biñan has received 16.4% national TV ratings lower than the viewership share from the previous weeks - 17.9% (September 19) and 22.5% (September 26). After their successful ANIMversary Kick Off at the Araneta Coliseum, It's Showtime hosts heated up the stage once more with their highly anticipated annual ‘Magpasikat’ performances. 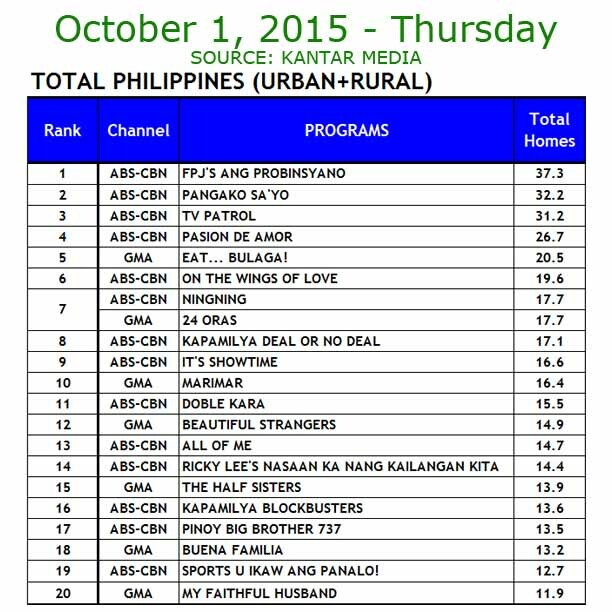 ABS-CBN's ‘Ang Probinsyano’ again hit the 40% mark on October 5 in national TV ratings with 40.7% beating Marimar with only 16.5%. Kapamilya Network Yes Weekend! block ruled Saturday and Sunday programming.